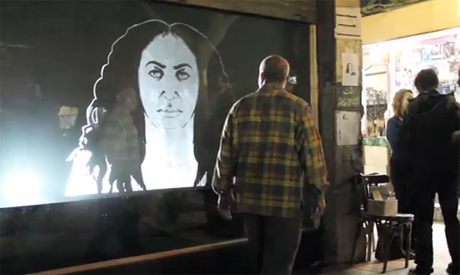 As part of the Downtown Contemporary Arts Festival’s (D-CAF) visual arts programme, an interactive street art installation entitled Face the Vitrine, was launched earlier this week in Mahmoud Bassiouny Street, intriguing some passersby and unsettling others. Through projecting a series of large faces across a storefront in Downtown Cairo, their eyes tracking people on the sidewalk, visual artists Ganzeer and Yasmin Elayat play with the concept of surveillance as they invite the street to interact with the artwork. This 30-day site-specific installation, launched during D-CAF's final week, is the first in a series of projects by Ganzeer to be held in this store window, in collaboration with a new artist every time. This installation series is supported by a grant from the Arab Fund for Art and Culture (AFAC), and the space was lent to Ganzeer by Ismailia for Real Estate Development, a company on a mission since 2007 to revitalise Downtown Cairo (the epicentre of Egypt’s growing independent art scene) through buying out properties and renting them to residents, artists, and cultural initiatives. For the duration of the month-long project, a new face will be projected on the storefront every day. The debutant face peering out of the shop window bore an eerie resemblance to Ganzeer himself. “Yes, this one is me,” the artist told Ahram Online on the downtown sidewalk Monday. Most of the faces projected on the store window represent people who volunteered to be photographed and illustrated by Ganzeer. Yet the artist is considering adding a few iconic faces from Egyptian and world history, “maybe Nefertiti, maybe Saad Zaghloul, maybe Stalin,” Ganzeer muses. The project is designed as an experiment, where the artists observe the reactions of passersby to the projection. Weaved into a background they pass day after day, the installation is intended to stir a reaction in people otherwise going about their daily routine. Drawing upon Ganzeer’s experience with street art and Elayat’s knowledge of interactive digital art, the duo constructed a public art installation that would engage the community. Using motion-tracking technology typically used in digital game controllers, and an infra-red camera to sense people’s movement at night, the projected faces’ eyes are set up to follow people as they walk down the street. The roles of subject and object are reversed: the men and women on the sidewalk become objects of the window’s attention, while the face in the window becomes not an object but a subject looking out. Public art has the function of rendering ordinary citizens spectators, or even better, participants in a work of art. It can also inspire people on the street to see space differently; it catalyzes a certain hypersensitivity to a vicinity, and in turn, trains people to notice things they would normally overlook. As a result, citizens engage with the environment at a more intimate level, spotting the extraordinary in the mundane. The idea for this installation was sparked by a conversation about sexual harassment last October between the two artists, when the mounting attacks on women, particularly in Downtown Cairo, became impossible to overlook. Elayat had jokingly suggested that people should install surveillance cameras on the streets to catch the perpetrators, and the idea evolved from there. The installation also addresses the multitude of identities that exist in a bustling urban landscape such as Downtown Cairo, and how the comfort levels of citizens are altered in relation to different “faces” represented. Public art can be a tool for bringing people together and striking up challenging conversations around given issues. Whether it is Banksy’s murals on the segregation wall in Palestine, or street art by Kabul’s 24-year old graffiti artist Shamsia Hassani, or Ganzeer’s post-revolution martyr murals, the presence of art in public spaces is a growing phenomenon in cities across the globe. What is significant about interactive street installation art is that it engages more people than a gallery space could ever hope to host. This shift in location, from private gallery to the public street, evokes a deeper sense of involvement. The thousands of Cairo residents strolling or rushing down Mahmoud Bassiouny Street every day will be automatically rendered both witnesses and participants in this public art project. The window’s reflective material is in itself evocative of the project’s essence; an interactive endeavour that is sensitive to its surroundings — even to the time of day. Subtle in the daylight and more compelling during the evening, the storefront projection is meant to elicit all sorts of reactions from the audience. It seems that this storefront will be a site for projects that provoke and possibly haunt their beholders in the upcoming six months.